President Donald Trump said on Friday the US will enter PPAP trade deal negotiations with Japan. 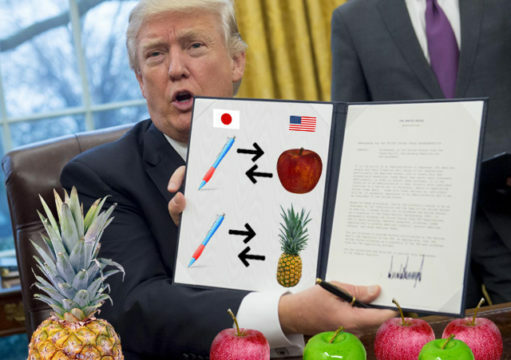 “Trading pens for apples and pineapples for pens will make America great again!” Trump told White House reporters. Trump says any new PPAP deal with Japan will be a “very very good deal”. Trump says he will “win way more pens than crooked Hillary would have gotten for her apples”. Trump signed a PPAP executive order last year but was surprised to learn he needed a partner to start a partnership.